This year, thousands of students will dedicate their time to the study and memorization of Scripture through the Summer Study. During the Summer Study, each participant studies a passage of Scripture along with the memory passages. The Discovery Journal prepares and encourages participants to memorize and study Scripture in 20 minutes a day with the option of a deeper study. It is designed to be flexible enough for any context, from school and church curriculums to personal study time. 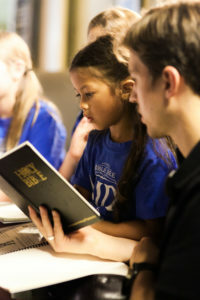 We believe that God’s Word speaks to all of us, regardless of age. The Discovery Journal is available with 2018 Summer Study participant registration. An electronic copy is included with the cost of registration, but hard copies of the Discovery Journal are available for purchase in our store.